Fran Borra (Argentina) — Fran is a musician and DJ with more than 25 years of experience. He is the producer of Tangorra Orquesta Atípica, touring Europe and Latin America, carryting their muaic to more than 15 cities in 25 concerts. In 2006, he founded Psycho Project: a musical collective that amazed by its versatility and wide musical repertoire. As a music producer his works have included coproductions with international artists such as Johnny Dangerous, Gebrüder Teichmann, Markus Schatz and others. He is currently the resident Dj of the Neolonga of Buenos Aires and Milonga 'La Jacinto', as well as being a guest DJ of the main milongas of Buenos Aires. Nicolás Dwornicza (Argentina) — Nico, also known as Nico Calavera, is a musician, producer and dj of tango. Known for his electrotango duo Acid Tango, he is considered one of the pioneers of the genre. 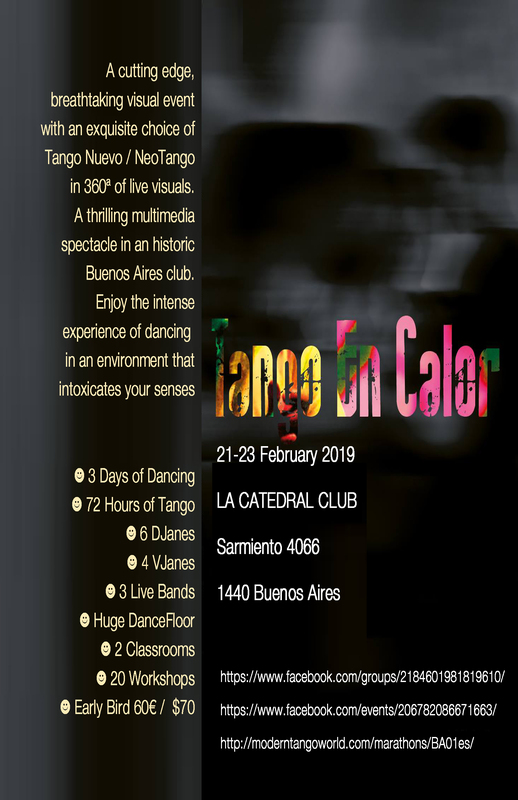 His history includes productions at iconic places in the city of Buenos Aires such as La Catedral, La Usina del Arte and the Tango Festival of Boedo. His style combines the use of machines and electronic synthesizers, with the sampling of well-known electrotango bands such as Otros Aires, Narcotango, Bajofondo and Gotan. Alejandro Delgado (Argentina) — Since 1986, Alejandro has been dedicated to computer animation and digital imaging, both as an educator and digital artist. He has been producing VJ performances since 1987. In 2005, he premiered the documentary film, "Los Bravos". In 2015, the film "Generacion Artificial", directed by Federico Pintos, presents Alejandro as an Agentine VJ pioneer. Alejandro has VJ'd at various festivals in Latin America and Europe. Martin Delgado (Argentina) — Martín is a guitarist, composer, producer and teacher. With his tango fusion group San Telmo Lounge, he has produced 6 albums, anf toured Europe and Latin America. He has written the music for numerous soundtracks for theater and cinema; Several of these works are included in his CD "Música Desparramada". He is also the composer of the Tangomorfosis music, conceptual work for the orchestra, rhythm section and 4 singers that he recorded with Adrian Abonizio and Hernán Pérez. He currently has a catalog of more than 200 titles in Sadaic. Raymond Lauzzana (United States) — Raymond is the publisher of Modern Tango World. He has been a member of founding teams for numerous computer graphics magazines and organization, such as ISEA, ISAST, Computer Graphics World. and Wired His artwork may be found in New York's MOMA, and many other museums. In 2003, he devoted himself to modern tango. He is a true musical omnivore. He tends towards the deeper more passionate music. His favorite genres are NeoTango, Tango Nuevo, International Guardia Vieja, Blues, Soul, and Rap Tango. and organizes milongas into tandas, around a theme. Volker Marschausen (Germany) — Volker, also known as "Tanguerilla Visual Poetry" has been dancing tango for more than 25 years. He is the organizer, DJ and VJ of Tanguerilla and NeotangoRave, the international, multimedia Tango events. His mix of danceable music is a selection of Tango Nuevo, Neotango and Tango Progressivo enriched with a touch of refined Fusion. His hand crafted music selection is the perfect match for 360° live-visuals His thrilling multimedia spectacle will be an intense dance experience that intoxicates the visual senses. Val Marraco (Argentina) — Val is a creative artist who bases her art on dance and performance around technological systems. She has produced interactive dance pieces and visual environments generated as video games. Her world of images refer to different cultures, the universe with dance as a language that connectsinto her live cinema. She has incorporated her work into live visual performances at TangoMagia Festival in Amsterdam and the NeoTangoRave in Bremen, Germany. Peggy Schorn (Germany) — Peggy has been DJing and organizing neotango events for over seven years, She is based in southern Germany, and has DJed at the NeoTangoRave, Roma NeoTangoMarathon, Tango Biathlon Munich, Festival FemmeFaTango Stuttgart, Ocho Neotango Marathon, Nantes Tango Marathon, Neolonga Ocho, Lalo Milonga, Stuttgart and many more. Her main focus is to provide an inspiring and creative, yet always danceable, musical landscape for the dancers. She likes smooth transitions between songs but loves even more the holy silence after each tango. Danuta Słabińska (Poland) — Known as DJ Danusia, she is a well-known European NeoTango DJ from Warsaw, Poland. She has played for dancers at milongas, marathons and festivals in Poland, Germany, Italy, France, England and Sweden, rooted in traditional tango of Poland with its 100 year tango history. Her emotional playlists are composed of contemporary tangos, nuevo, elektrotango and nontango, often with a special theme and always with Polish songs inclluded.